Follow KQED's ongoing wildfire coverage. Acreage and containment: On Nov. 25, Cal Fire said the fire had consumed 153,336 acres — an area larger than Chicago — and was 100 percent contained. Casualties: Officials have confirmed the deaths of 86 people. So far, Butte County authorities have released the names of 47 of those who died, and at least another 11 have been confirmed as having perished by family members in news accounts. See the current list at the bottom of this post. Cal Fire said five firefighters were injured fighting the blaze, including two inmate firefighters. Damage update: Cal Fire currently estimates the fire has destroyed 18,793 structures, including 13,696 single residences, primarily in and around Paradise, a town of 27,000 in the foothills east of Chico. 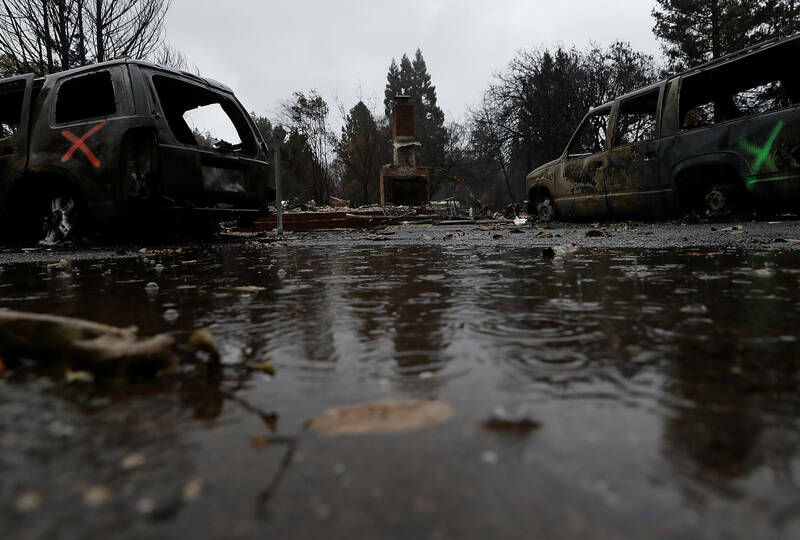 That makes the Camp Fire the most destructive fire in terms of structures destroyed in recorded state history, surpassing last year's Tubbs Fire, which destroyed 5,636 structures and killed 22 people. Butte County, the town of Paradise and Cal Fire have teamed up to develop a variety of interactive maps to provide evacuation area information and assist property owners in determining the status of their property. Cal Fire also created an interactive map where you can search for damaged and destroyed structures. However, damage inspection is still ongoing and subject to change. Missing persons: The Butte County Sheriff's Office has been releasing an updated list of missing persons in an effort to locate individuals. Last Friday evening, the missing sharply dropped to 49. By Wednesday night, Dec. 5, the list had dropped to 10. See the list of missing here. The Sheriff's Office has requested those who left the area safely to register on the Red Cross Safe and Well site. Evacuation orders: The Butte County Sheriff's Office has continued to downgrade and lift evacuation orders and warnings. There are still numerous mandatory evacuation orders in place in the fire area. Those orders are frequently updated on the sheriff's Twitter and Facebook feeds, as well as the official Butte County website. Roughly 52,000 people have evacuated. Cal Fire has created an online interactive evacuation map, but cautions residents to refer to local law enforcement for current notices. Though the data are updated as often as possible, it might not provide the latest information. Cal Fire is also issuing incident updates, which includes a comprehensive list of evacuation zones, at least twice a day. You can find the update on Cal Fire's Camp Fire incident page or sign up for automatic email updates. The Chico Fire Department and Chico Police Department are also issuing Twitter advisories. Emergency shelters: Below is a list/map of Red Cross emergency shelters in the region. Butte County and the American Red Cross have begun consolidating shelters. All shelter sites will begin moving occupants to the Butte County Fairgrounds. Recovery Services: A Disaster Recovery Center has been set up at 1982 E 20th St. in Chico where those affected by the fire can access resources 9 a.m.-7 p.m. each day. People can register for disaster assistance at www.disasterassistance.gov or by calling 800-621-3362. Paradise and Butte County have set up a website to provide residents affected by the Camp Fire a one-stop shop for information and resources for the recovery effort: buttecountyrecovers.org. Residents in these service areas are being advised to flush their taps for five to 10 minutes after returning home. How to help: Experts say financial contributions are the best way to help people affected by the fires. For a list of organizations accepting donations and more information on other ways to help, click here.